Caveat: Although others have reportedly had success with this baseball gambling system, I have not personally tested it so if you decide to use it, please use caution. I do intend to test this system live in 2012. This simple baseball gambling system, with only two rules, shows the importance and value of starting pitching. It demonstrates why you should be cautious when betting against good starting pitching, especially if the bookmakers deem their team as the underdog. 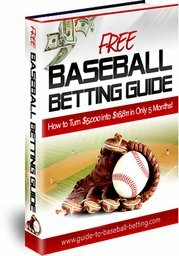 To use this baseball gambling system you must first collect the necessary information. Click on MLB Games to get a listing of the daily MLB baseball matchups, starting pitchers, and odds for the day. Make a list of the starting pitchers that are playing for the “underdog” teams. Underdogs are teams with odds at +100 or higher. Rule 1: The starting pitcher must be ranked in the top 20. You determine this by visiting Jeff Sagarin computer ratings. Click on the National or American League to get a ranking of every pitcher in the league. If Sagarin ranks the starting pitcher in the top 20, proceed to Rule 2. Rule 2: If the underdog is playing on the road, determine if their road record is above 48%. If the underdog is playing at home, check and see if their record at home is above 48%. Click on ESPN MLB Standings to determine the home and road records. If the answer to both rules above is yes, place a bet on the underdog. How well did this gambling system do in 2010? If you would have bet $100 on every underdog team that met the above two rules, you would have won 110 games and lost 91 games for a 54.73% win percentage and a net profit of $4,254. What’s most remarkable is that the win% for the home and road dogs in 2010 was almost the same (54.67% and 54.76% respectively.) The home dogs’ record was 41 wins and 34 losses for a net profit of $1,380. The road dogs had 69 wins and 57 losses for a profit of $2,874. If you stay to these two rules, and use sound money management techniques, you can do well using this baseball gambling system.